A bathroom scale works by pushing back at your weight when you stand on it. Your weight is a force caused by your body mass and the Earth’s characteristic acceleration of gravity. The scale pushes back with a spring system but deflects slightly under the load. The scale is then measuring the deflection allowed by the springs at the equilibrium where the spring force exactly counteracts your weight. More weight pushing down results in more deflection to the equilibrium point and that thereby results in a bigger reading (i.e., think: the Monday after Thanksgiving). The gray object with the funky cut through it is a metal piece. As you can imagine, when forces are applied as shown, that slot on the right-hand side will tend to close slightly. In turn, that would cause the metal on the left-hand side to stretch slightly as the whole thing bends a very little amount. We measure that slight stretching of the metal on the left-hand side with a strain gauge bonded to the surface of the metal. A strain gauge is a small electrical device that changes resistance when stretched. Using an electrical circuit known as a Wheatstone Bridge, we measure small changes in electrical resistance caused by the slight deformations of the load cell. The amount of stretch can be astonishingly small and yet good strain gauges and good electrical interpretation of the output can yield very accurate data. 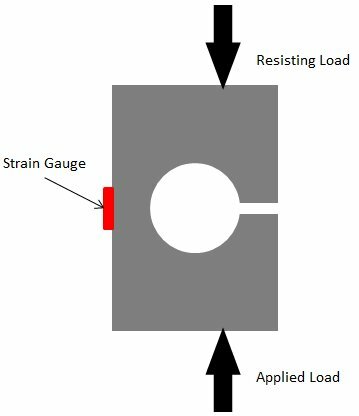 The load cell is then calibrated using a known applied load and measuring the resulting strain (i.e., metal stretch). You now have a more rugged version of a bathroom scale. Apply a load, get a reading, and, ta-da, you’ve measured push. Actual load cells used for rocket engines can take different forms from the generic cell shown here. Any way that you can get an applied load to result in a slight, measureable stretching of metal (while obviously avoiding yielding or buckling) is a valid load cell design. Above is a picture of a vertical load cell arrangement on test stand A-2 at the NASA Stennis Space Center, where we’ve been testing J-2X development engine E10001. There are two pieces in series. The bottom piece, the big chunk of metal with a bunch of crazy holes and slashing cuts through it, is called a “flexure,” which, to me, seems to be a silly name since it doesn’t look very flexible at all. What it does, however, is effectively make sure that the load entering the load cell is properly directed through the intended vector. Any skewing of the input off from the intended axis and your results could be erroneous. The brown cylindrical thing above the flexure is the actual load cell. You can see the strain gauge wires coming out of it that are fed into the data acquisition system. This two-piece combination is effectively analogous to a spring in your bathroom scale. The next item to discuss is how you put load cells into the structure of the test stand so that they can do their job. On a bathroom scale, the thing that you step onto is essentially a platform “floating” above the base. It has to be free to move so that the springs can compress honestly. If there was some interference with this movement, then the reading would be wrong. The same is true on the test stand when measuring engine thrust. It is necessary to use a free-floating platform. The picture below is a drawing of the platform used on test stand A-2. 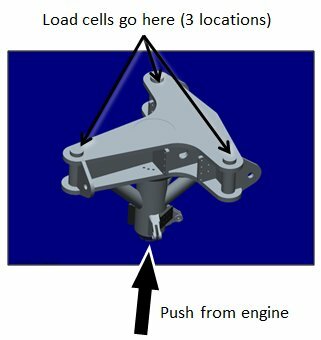 The engine has a single input point as shown — the gimbal bearing that we’ve discussed before in previous articles — and there are three load cells above the platform. This is not the only possible way to do it. Other test stands use a rectangular pattern of four cells. Or, if it’s a smaller system, you might be able to use just a single load cell. The important point is that the load cells are in between the pushing engine and the resisting test stand. Put into the structure of the test stand, and viewed from the side as in the picture below, you can see the whole stack up. On the bottom is where you attach the engine. In the middle is the platform into which the engine pushes. And then the platform is connected to the structure of the stand through the load cells. The structure of the stand has to be strong enough to absorb the thrust of the engine without distorting. It has to be fixed (the mythical “immovable object” from physics class). So, as you can imagine, when you’re talking about hundreds of thousands or even millions of pounds of force, the test stand structure is pretty darn stout. We usually refer to the primary structure responsible for resisting the force of the engine as the “thrust take-out” structure. A final subject to mention is that matter of tares. Tares are corrections to measured data. For example, when you step on the bathroom scale and you’re dressed, do you subtract off an estimate for the weight of your clothing and your shoes? If so, then you’re making a correction for a particular tare. Of course, you have to do this accurately (honestly). 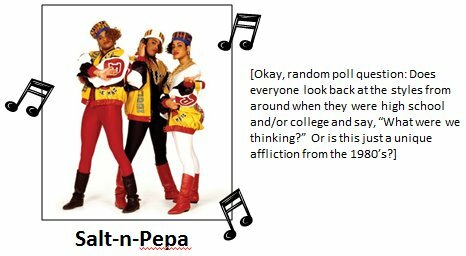 If I assume that my clothes and shoes are made of lead, for instance, then I can declare that I weigh the same as when Salt-n-Pepa were releasing their first albums. But that’s not quite the truth. Getting your tares correct is important for interpreting your data correctly. When measuring rocket engine thrust you have lots and lots of corrections to the raw data that you measure with your load cells. 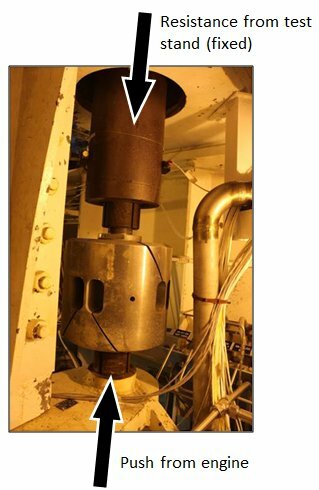 This is because, in truth, the gimbal bearing is not the only connection between the engine and the test stand. While you’d really like to have that perfectly free-floating platform situation, you’ve got to have, for example, propellant feedlines hooked up to the engine. Flexible bellows are built into the line so that they’re not completely stiff and thereby interfering with the movement of the platform, but they still absorb some of the thrust load and, therefore, make the raw thrust reading skewed. 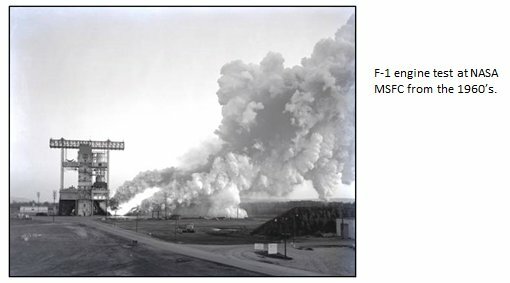 There are a number of other such corrections that need to be made such that the whole calculation process related to tares can get a bit cumbersome with all its many pieces, but nobody ever said that developing rocket engines was supposed to be easy, right? Now, between this article and the previous one, you have a good idea of how we get basic performance data from rocket engine testing and also the necessary configuration of the test stands that allow us to gather this information. The smoke and fire and rumbling roar of an engine test is all very impressive, but for us Datadogs, it’s the data that matters most. We get lots and lots of data from every test, but propellant flow rates and engine thrust are the most important in terms of understanding how an engine fits into a vehicle and a mission.